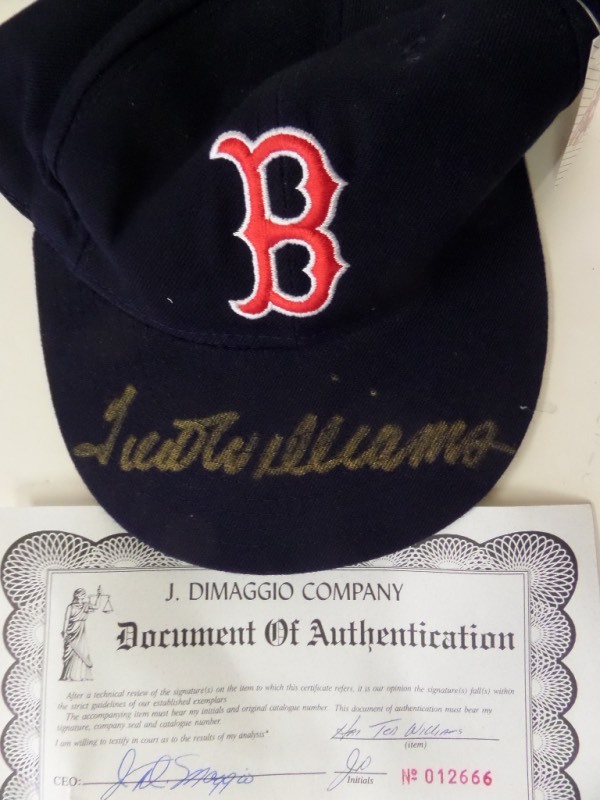 Coach's Corner - Ted Williams hand signed "J. DiMaggio Co." certified Red Sox cap! Go Back to Lot List Ted Williams hand signed "J. DiMaggio Co." certified Red Sox cap! This great-looking collector's item is a NM, fitted Boston Red Sox cap from New Era's Diamond Collection, complete with original tagging still attached. It is hand-signed in gold sharpie right on top of the bill by the 2 time Triple Crown winner himself, and comes with a COA from the J. DiMaggio Co. for authenticity purposes. Valued well into the hundreds!